Shape form work well underway now for one of our latest sculptural commissions - a series of wall mounted pieces for a new school building in town. 'Tree Music' consists of a grouping of 8 elements that line the main light well corridor passage way through the centre of the school. 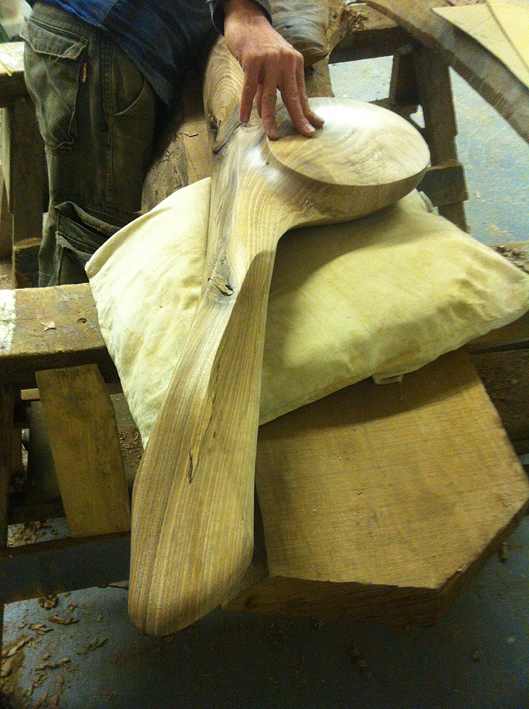 The elements are all carved in walnut from a tree that was originally growing on the new school site. Below is an image of the lower portion of one of the paired element installations near completion. Next week will be test fitting and scribe marking out for some of the larger elements, so more pics to follow soon. In the mean time below is an image of a 'concrete aerial blockhead'. Let you keep guessing about that for now, however if you have read earlier posts you may well have an idea what that is all about!